In general, the higher you can get your CB antenna the better your reception will be. Well, a TJ with a soft top doesn't afford many "high" places to mount an antenna. The answer, in many cases, is a mounting bracket. 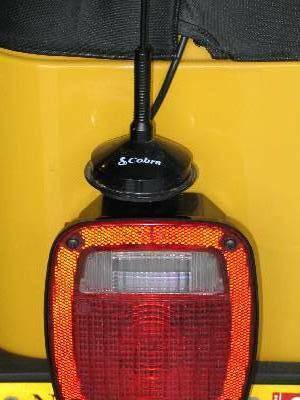 We chose the driver's side rear taillight as our mounting area. 1. Remove the four Phillips head screws from the taillight lens and gently pry the lens out with a flat tip screwdriver. 2. 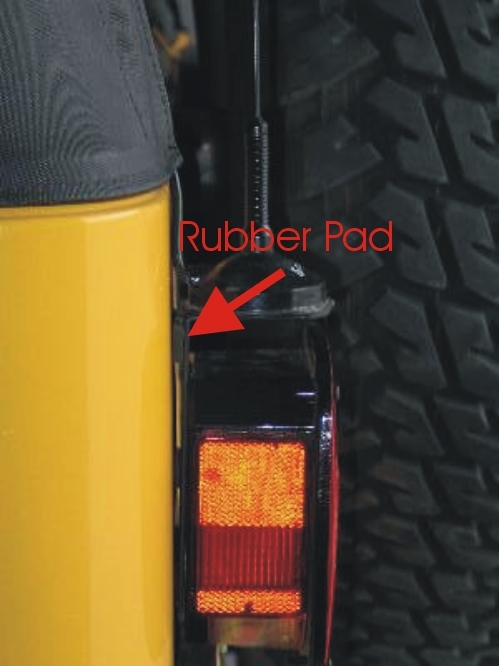 Remove the three hex head screws that hold the taillight to the body. 3. 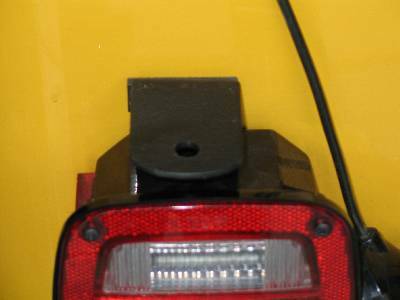 Place the taillight lens on the 9 1/2" piece of steel and mark the spots for the outside-lower and top body screw holes on the steel. There should be at least 3/8" on either side of the two holes. 4. Measure 3/4" from the opposite end of the piece of steel and mark the spot for the 3/8" hole that will be used to mount screw-on mounted antennas. Measure to the center of the piece of steel (1") for the cross line of the 3/8" hole. 4. Drill the holes as marked. Tip: It is easier to drill the holes before the steel is bent. 5. Measure 3" from the end of the piece of steel with the single, larger hole (where the antenna will mount). 6. Using your square, mark a line across the piece of steel at your 3" measurement. 7. Place the piece of steel in your vise with the 3" end down. Be sure you accurately line up the marked line with the jaws of your vise. This will be your bending point. Tip: Double-check your bend direction before you begin to heat the piece of steel. 8. Heat the steel for about 2 minutes if using a small propane torch or until it begins to glow red. 9. Using a combination of hand pressure and hammering, bend the steel to a 90° angle. Caution: Always use heavy gloves when handling hot steel. 10. Using your compass or circle template, mark a half circle on the short end of the piece of steel. We'll round the exposed end so it doesn't catch anyone walking by the vehicle. 11. Cut off the excess steel using your hack saw or jig saw. 12. File down any rough edges or drilled holes. 15. 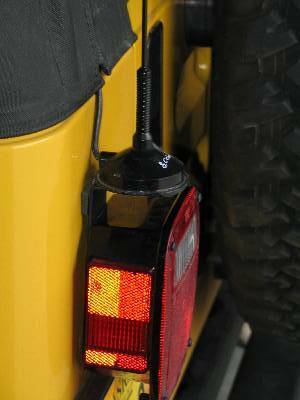 Slide all three hex head screws into the taillight assembly and carefully slip the new bracket over the screws. 16. Place rubber washers over the two screws that run through the new bracket. 17. Place a metal washer and then a rubber washer over the third screw. 18. Tighten the hex head screws hand tight. Do not over-tighten or you may crack the plastic taillight housing. 20. Mount your antenna per the manufacturer's instructions. Note: If your antenna requires more space below the bracket, simply use a longer piece of steel.